A highly recommended read that not only encourages, but also gives Truth to readers to walk in Covenant Blessings in their New Life in Christ! 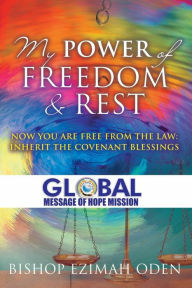 CBM Christian Book Reviews ~ My Power of Freedom and Rest - Now You Are Free From the Law: Inherit the Covenant Blessings by Bishop Ezimah Oden, PhD presents a fascinating and powerfully written book that speaks of the wonderful privileges and Covenant Blessings we have in Christ as a Child of God. Engaging, Biblically based, and well-written, this book encompasses Truth ~ the Truth of God’s Word, His Spirit, His Blessings, His Peace, His Righteousness, His Grace and so much more ~ by reading and applying the truth of this book, one will learn to walk in freedom and rest in Christ. Truly a faith-filled read that helps readers to understand the Old Covenant that is based on the Law of Moses and the New Covenant based on the Grace of the Lord Jesus, bringing freedom to walk in the Spirit, as your mind is renewed by the Living Word of God. My Power of Freedom and Rest is one of those foundational reads that EVERY Christian should read, believe, understand and walk in. The author helps readers understand their identity in Christ, their inheritance by the Covenant Blessings that have brought salvation, the remission of sins by the Blood of Jesus, while giving insight into knowing their enemy (Satan) by giving them the tools to faith and spiritual warfare. Topics such as: The Covenant and the Law, Encounter with the Supreme Judge, The new living way by the Blood of Jesus, The Dilemma of the law and faith, Understanding the terms of the New Covenant, Know your new nature in Christ, Beware of satanic manipulations, How to claim your Covenant blessings, Grace and Glory, Living in the power of the Spirit, Walking in alignment with the Word of God, The Sabbath Rest and Living by faith make this a power-packed, but easy-to-read perspective that not only offers the Good News of the Gospel, but presents readers with truth, hope and encouragement. You can get your copy at Barnes and Noble, in NOOK Book. Be sure to visit the author at Bishop Ezimah Oden for some great ministry.